“Regarding suicide I just don’t have sad emotions,” says Jacob, the occasional narrator of The Treasurer, Max Posner’s deeply felt, sharply observed play about dementia and care-giving. Jacob (a no-nonsense, resentful Peter Friedman) is the hard-as-nails son who, along with Allen and Jeremy, the more accommodating brothers, must take care of his widowed mother, Ida (Deanna Dunagan, who charts a painfully realistic physical and mental decline). By the play’s end, Jacob is as sad as can be. 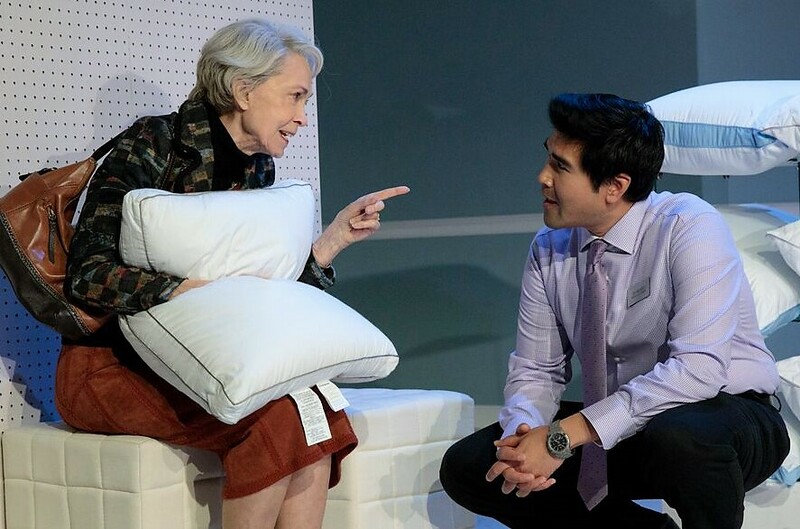 Posner has drawn elements of his play from the decline of his grandmother, yet in the script Jacob’s character is called simply The Son—it’s a universal role, and the specific name that we come to learn may have a particularity to this man, but he represents the experience of all children who deal with aging parents. It’s hard to watch and listen to as Ida loses her husband, Don, and Jacob tries to make her realize she hasn’t got the money to move into a swank retirement home where her friends are. More difficult is that Jacob lives in Denver and she lives in Albany, N.Y. But Ida manages to wheedle and make Jacob feel guilty, and Jeremy and Allen (mostly unseen, and voiced by Pun Bandhu and Marinda Anderson, respectively) serve as her advocates. It falls to Jacob—he’s the treasurer of the title, and it’s he who pays the bills, both financial and emotional—to navigate the hurt feelings, anger, and exasperation of dealing with his mother time and again. Deanna Dunagan (left) plays a confused Ida Armstrong and Marinda Anderson is a Talbots clerk in Max Posner’s The Treasurer. Top: Peter Friedman in the title role. In several scenes—as Ida takes a call from a fundraiser for the Albany Symphony Orchestra and contributes money she doesn’t have (a rich comic moment), to replacing her dying dog, to shopping for a pair of purple corduroy slacks—Dunagan charts the decline of a pleasant, self-sufficient woman. “Some days it’s like a dull seminar in a women’s college in the 1940s,” she says, settling into her first home as a widow. The loneliness is a challenge for Ida: the real declines are yet to come. She doesn’t give in to it but tries to engage with the world. In a Talbots store she spots some purple slacks and becomes overly talkative with a clerk (a kind but slowly bristling Anderson). Eventually the vital Ida turns confused, irascible, and, finally, incontinent and frail. She becomes a nuisance and then a burden. But there’s another reason for the emotional chill inside Jacob. He resents Ida for leaving him and his brothers and running off with Don, who became his stepfather. The hints that Posner drops are few, and a crucial one comes during Jacob’s attempt to log into his mother’s online bank account during a weird fantasia (one of the few times that Posner’s writing seems to strain for effect). A comical series of questions to establish his identity becomes more and more specific, until one learns that Jacob knew about his mother’s affair. Friedman manages to balance Jacob’s resentfulness with the suggestion of an unseen reservoir of pain, yet he can also be delightfully deadpan as he describes elements of his own life, particularly his wife Nora’s visits to her hairdresser, Ricky. One stony look from Friedman’s Jacob is all one needs to know that Ricky is gay, and his life is a mess, and that Jacob is able to indulge Nora’s affection for Ricky. Dunagan with Pun Bandhu as a salesman in a bedding store. Photographs by Joan Marcus. The action plays out on the edges of a generally bare stage. Ida’s swank apartment, for instance, is a chair, mirror and table at one side; Jacob’s computer and table are at the other side of the stage, and very little comes in between (although a bulky hunk of scenery sits awkwardly downstage till it’s opened late in the play). It’s as if designer Laura Jellinek is physically showing the large empty spaces that are slowly taking over the center of Ida’s mind, and the emotional voids inside her son that can’t be filled. The flickering lights and blackouts contributed by Bradley King amplify the feeling that connections are being broken. David Cromer has directed expertly, blending humor and anger and sadness into a cohesive whole. At one point, Ida calls a number she remembers although she can’t recall to whom it belongs. A guy named Julian (Bandhu) answers, and it becomes clear the number is that of his cellphone and that they have never met. But Cromer keeps the conversation going longer than it probably would in real life. Bandhu’s silences and slow opening up are beautifully played, until Julian and Ida establish a connection. The careful modulation of their unlikely encounter makes the final broken connection especially sad. As emotionally wrenching as the play is, it’s also a marvelous introduction to a young writer with the astonishing talent to convey truths that apply more forcefully to a generation he doesn’t belong to—his ability to empathize so vividly is no small achievement. 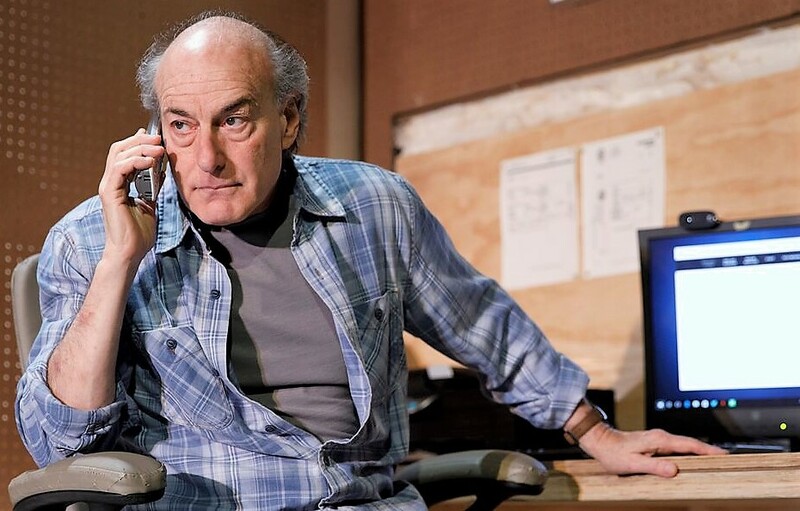 Max Posner’s The Treasurer plays through Nov. 5 at Playwrights Horizons (416 West 42nd St.). Evening performances are Tuesday through Saturday at 8 p.m. and Sunday at 7:30 p.m.; matinees are at 2:30 p.m. Saturday and Sunday. For tickets and more information, call Ticket Central at (212) 279-4200, or visit playwrightshorizons.org.